WITH this issue of the little paper we enter upon one more year of its ministry. To have 'continued unto this day' is a testimony to the faithfulness of God in the 'help received', for, indeed, behind these forty-seven years there is a history of His wonderful grace and sustaining! More than that, as we review the way travelled with Him, we are deeply impressed with the growth downward, upward, and outward of the ministry. It was a simple beginning those years ago, when the message of the Cross was fresh (with us), born out of a revolutionary crisis. That has remained basic, but the light has increased and 'the open heaven' has brought ever greater fullnesses of light as to God's eternal counsels. I think that it is not only the natural sense of shortening time and the "course" being far run that makes us feel that His Coming must be getting very near, but rather does it seem that things just cannot go on as they are doing indefinitely. On one side the "cup of iniquity" is fast filling up. The challenge to the very existence of God or of His rights is extending and intensifying so greatly that He will answer it when the "cup" is full. At the other end there is such a great intensifying of evangelism -- even if of a broad and elementary nature -- expressive of the great "drag-net" which, by its various means -- evangelists, radio, literature, etc. -- seems to mean that the world must, at least, have heard the Gospel of Christ. Between these two poles two other features are noticeable. There is the great cry for reality which is having the effect of shaking and discrediting much of traditional Christianity. There is also a very intense testing of the faith of the true people of God. This last is shown in the Scriptures to be truly characteristic of the end time. It is in this last context that we feel that our ministry relates. Recently a dear soul wrote to us asking that the paper should no longer be sent because (it was alleged) we do not teach the Second Coming of the Lord. The fact is that for these forty-seven years all this ministry has had definitely in view the preparation of believers for His return! Attendance at our conferences through the years would have left no doubt about this, when, at the end of the last gathering the conference has reached its peak of joy and glory in the singing of a hymn of His coming again. And, by the way, is not that atmosphere of glory the answer to every argument on the matter? The Holy Spirit is not the Spirit of time, but outside of time. Not of fixed dates, but of heaven's "hour". Not of "a thousand years", [1/2] but of eternity. He is "the Eternal Spirit"; therefore He lives now in that dateless "day". Thus, whenever we speak or sing of the Lord's coming, it is not only the hope that inspires, but the Holy Spirit bears witness and is present as the Spirit of Glory. Some of us in early childhood were told that 'the Lord may come tonight'. All those who said that have been in their graves for many years, but still the teaching has gone on. Still He tarries. But His sure coming is a very special ground for the Holy Spirit's witness. This answers all possible scepticism and that "Where is the promise of his coming, for since the fathers fell asleep all things continue as they were from the beginning". It is the Holy Spirit who says through the Apostle Peter: 'Thou fool, know ye not that a thousand years is as but a day with God, and a day as a thousand years.' Time is out of it with the Spirit, and His witness of life is the answer. But He will come, and "In my heart I have the witness that His coming draweth nigh". So, to have as much spiritual maturity at His appearing, or at our appearing before Him, we will pursue our little part and aspect of ministry. Appreciating everything other that can serve the ultimate purpose, we just seek to have grace to 'fulfil the ministry which we have received of the Lord'. What this new year holds we do not know. Perhaps some of us will be with Him, or it may be that His elect will have been caught up together to meet Him ere the year closes. We do solicit your prayers, as this ministry does not go on unchallenged. There is much and widespread hunger amongst the Lord's people, but there are many and strong adversaries to their receiving true bread! So much gratitude is due to the many friends who have strengthened our hands by their prayers, their expressions of appreciation, and in other ways. I cannot write to you all individually, but I want you to know that you are not just lost in the crowd. I know full well that I could not have gone on without your help. The Lord bless you very greatly this year. 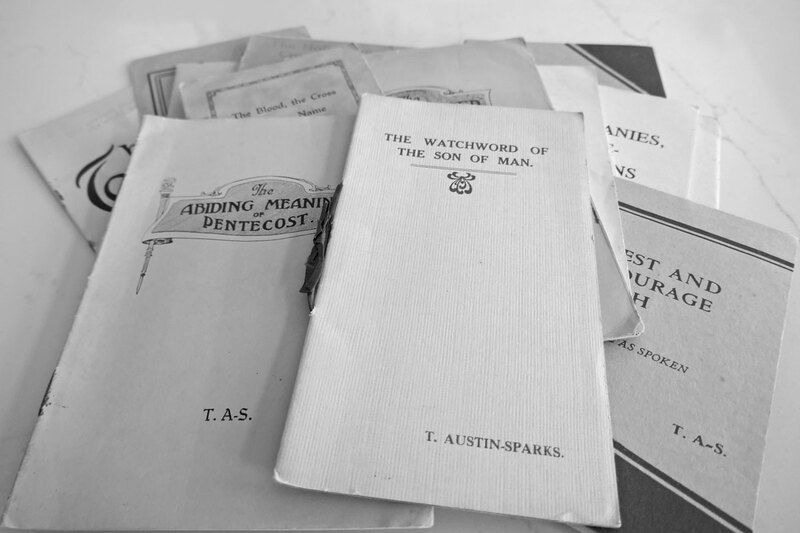 Yours in His grace, T. Austin-Sparks. P.S. Mrs. Sparks and my helpers in the office join with me in greetings and gratitude. -- T. A-S.
OUR motto for 1970 circles round the declaration of Jeremiah in chapter 32, verse 17 of his prophecies: "Ah, Lord Jehovah ... there is nothing too hard (wonderful) for thee." This declaration was made in circumstances of extreme difficulty. Recall that situation. Jeremiah was himself in prison, perhaps in a dungeon. His ministry, after forty years, was in a state of suspense, perhaps finished personally. Jerusalem was besieged by the Chaldeans, and about to be taken, and the land overrun and destroyed. The people were about to be taken into far captivity, and Jeremiah knew that it would be for seventy years. In that seemingly hopeless situation the Lord told Jeremiah that his cousin Hanamel would be coming to him as the next of kin who had the right of redemption to ask Jeremiah to buy -- redeem -- the family land, the field in Anathoth. It may have been a bit of shrewd business on the part of Hanamel for Jeremiah might most likely be killed and the field be lost if it had not been redeemed. Perhaps Hanamel was not accepting Jeremiah's gloomy prophecies and still believed that the country would be saved. However, for Jeremiah it was another situation; his prophecies were -- he knew -- going to come true. To buy the field was either foolhardiness or faith. He proceeded in faith, and carried out the transaction meticulously; and he left no question as to whose right it was. So Hanamel had been, and the Deed of Purchase was signed, sealed, and settled. Jeremiah, by right of redemption, was the owner of a field which, for long years, would lie under the heel of a foreign power. For himself , he knew that he would never occupy it. Was he -- maybe -- enacting a parable which had a far greater context? Was the far-seeing Spirit of God making Jeremiah's action a prophecy? Was there Another Redeeming Kinsman in the shadows of Jeremiah's transaction, One who would redeem His rightful inheritance and have to wait long years, while the enemy -- the prince of this world -- ruled in it? Was Jeremiah just yielding to the pressure of circumstances? Jeremiah suffered this come-back. He seems to have come alive to the implications of what he had done, and a battle took place. He had to call to his help the omnipotence and sovereignty of God. "Ah, Lord, Jehovah, behold, thou hast made the heavens and the earth by thy great power and by thine outstretched arm; there is nothing too hard for thee." This, surely, is a foreshadowing of "the faith of the Son of God". 1. There are times when we are so sure that the Lord has led us in a certain way, to take a certain course, to do a certain thing, or to a certain purpose. It comes to us with much life and assurance. At the time there seems to be real corroboration that it is of the Lord. Even our Hanamels turn up on time. We make our committal, set ourselves to the call or demand, and faith is all agog. Then, we are invaded by the adverse forces, like the prison in which we are found, or like the armies of the Chaldeans besieging. The temptation is to wonder if we have been mistaken, misled, and a trick has been played on us. A battle in the dark ensues and the whole question of the faithfulness of God is raised. How true to history it is that the Lord's people, and His servants in particular, can never take a position with Him without -- sooner or later -- being tested severely by that very position! That important factor in Jeremiah's action must be borne in mind. Jeremiah acted without any personal interest influencing him. He was detached from his action, for he knew that he would not live to see the redemption made good. Faith was selfless and looked beyond his own lifetime. That is a very real test of its genuineness. Such thoughts never weakened his action! Perhaps the very reactions and assaults of doubt are only allowed in order to test the quality of faith. A dungeon and an enemy host are sufficient to test the reality of vision! 2. "While we look, not at the things that are seen, but at the things which are not seen." Jeremiah had an overwhelming amount of the impossible, the "too hard" in his seen situation. It would have been so easy at any time to surrender to existing conditions. Every servant of God who has been given "the heavenly vision", and been made acquainted with God's "eternal purpose" has, after a thoroughgoing committal, and some encouraging corroborations, come to the time of severe testing by circumstances which raise ultimate questions. The conditions argue that it is a vain hope; life will pass in disappointment. Think of the vision of Peter, John, Paul, and then consider the state of the churches. They must have had some vision which eclipsed and transcended "the things which are seen". Paul said: "... we look at the things which are not seen." "Things", not imaginations, makebeliefs, vapours, but actual things not seen. These are the "eternal" and, like Jeremiah, the horizon of realization is beyond this hour. How easy -- to our time-fettered life -- it would be to say that the Church is in ruins and irreparable; we labour in vain if we pour our lives out for the ideal! Well, the saints of old, the Prophets, the Apostles, and above all, our Lord Jesus in His humiliation, rebuke us. "Faith is the title deeds of things not seen." Jeremiah with the Deeds of Anathoth fits right in there. Jeremiah linked this whole issue with God's Throne. This is the refuge of the sorely tried in faith. "There is nothing too hard for thee." 3. We must ask the Lord to, first, cleanse our hearts of all personal, and worldly motives and interests; to plant the Cross fairly and squarely in our soul-ambition, and then enable us to "buy the field" in confidence. "And when Abram was ninety years old and nine, the Lord appeared to Abram, and said unto him, I am God Almighty; walk before me, and be thou perfect. And I will make my covenant between me and thee, and will multiply thee exceedingly. And Abram fell on his face; and God talked with him, [3/4] saying, As for me, behold, my covenant is with thee, and thou shalt be the father of a multitude of nations. Neither shall thy name any more be called Abram, but thy name shall be Abraham; for the father of a multitude of nations have I made thee. And I will make thee exceeding fruitful, and I will make nations of thee, and kings shall come out of thee. And I will establish my covenant between me and thee and thy seed after thee throughout their generations for an everlasting covenant, to be a God unto thee and to thy seed after thee. And I will give unto thee, and to thy seed after thee, the land of thy sojournings, all the land of Canaan, for an everlasting possession; and I will be their God. And God said unto Abraham, And as for thee, thou shalt keep my covenant, thou, and thy seed after thee throughout their generations. This is my covenant, which ye shall keep, between me and you and thy seed after thee; every male among you shall be circumcised " (Genesis 17:1-10). "For he is not a Jew, which is one outwardly; neither is that circumcision which is outward in the flesh; but he is a Jew, which is one inwardly; and circumcision is that of the heart, in the spirit, not in the letter; whose praise is not of men, but of God" (Romans 2:28, 29). "In whom ye were also circumcised with a circumcision not made with hands, in the putting off of the body of the flesh, in the circumcision of Christ; having been buried with him in baptism, wherein ye were also raised with him through faith in the working of God, who raised him from the dead" (Colossians 2:11, 12). "For the love of Christ constraineth us; because we thus judge, that one died for all, therefore all died, and he died for all, that they which live should no longer live unto themselves, but unto him who for their sakes died and rose again" (2 Corinthians 5:14, 15). "For we are the circumcision, who worship by the Spirit of God, and glory in Christ Jesus, and have no confidence in the flesh" (Philippians 3:3). WE ought to add other Scriptures to those, for there are many more which are of the same nature, but these are sufficient to bring us to the point of our consideration, which is the foundation law of God's Israel, the law of God's covenant, and that covenant is symbolized in circumcision. The sign of the covenant with Abraham was circumcision. In the Old Testament it was literal and material. In the New Testament it is spiritual, but the meaning is the same. It is a spiritual law of God's Israel, and that law is separation and distinctiveness. It lays down the law that God's Israel is a separate people, separate from all other people, and different from all other people -- clearly distinguished from all other people. Did you notice, as we read those Scriptures, that God said to Abraham that He would make many nations out of his seed? Now God is taking out of the nations a people for His Name, something in the nations, but separate from the nations, and that law of separation and difference is the foundation of God's Israel. We can see God keeping to that law in the Old Testament. It is written that "the God of glory appeared unto ... Abraham, when he was in Mesopotamia, before he dwelt in Haran, and said unto him, Get thee out!" (Acts 7:2). Later, Moses was in Egypt, and God just sovereignly took him out before He did anything else. Moses had to be out of Egypt first, and that was a very thorough thing, as you would think if you were out in a wilderness for forty years! Then the Lord sent Moses back into Egypt to get the people out, and the Word is: "Out of Egypt did I call my son" (Matthew 2:15). God could not proceed with His purpose until He had got His people out, for there is a place where God will fulfil His purpose, and He will not fulfil it anywhere else. I would like you to put a lot of lines under that statement, for I think it is the key to everything. Let me say it again: there is a place where God will fulfil His purpose, and He will do it nowhere else. God means business. He is a God of purpose, and He is very serious about His purpose, which is a purpose of blessing. To Abram He said: "I will make of thee a great nation, and I will bless thee ... and in thee shall all the families of the earth be blessed" (Genesis 12:2-3). God's purpose is a purpose of blessing; blessing to the instrument that He will use and to the people to whom He uses that instrument. "I will bless thee ... and thou shalt be a blessing." That is the purpose of God, and I say it with a strong voice, because I know that some will say: 'If we are going this way it is going to be a very difficult way. We are going to have to give up everything!' Well, wait a little while -- we have not finished yet! We make this statement: God's purpose is to bless and to make a blessing, but it demands a position. The blessing and the vocation depend upon where we are. Of course, in the Old Testament it was literal. Abraham was in Ur of the Chaldees, and God said: 'You must get out of this city. I am [4/5] not going to do anything here! I must have you somewhere else.' In the New Testament it is spiritual. Where do you live? In Bern, in Zurich, in New York, in London, in Paris, or in some other city? God is not saying to you: 'Get out of Paris!' or any of these cities, but He is saying, just as forcefully: 'Get out!' You may be living in your body in a city, but you may not find your life there. You may have been born there, physically, but now, as a true Israelite, you were never born there. You were born from above. God's covenant is bound up with this spiritual position, and we must really take serious notice of this. God has made a covenant with His Israel, but that covenant demands that they are out of somewhere and in somewhere else, and for us that means a different spiritual position. God's covenant is a covenant of blessing, of life, of service -- that is, Divine vocation -- but all that blessing, that life and that vocation are bound up with this matter of spiritual position. Spiritually we are out and we are different. That first Israel is not now in blessing, nor in life, nor is it in the Divine vocation. It is where the Lord Jesus said it would be if it rejected Him -- in outer darkness, where there would be weeping and wailing and gnashing of teeth, and for these many centuries the Wailing Wall in Jerusalem has fulfilled that prophecy! Why is that? There is one little fragment of Scripture which is tremendous but it has a terrible statement in it: "The covenant that I made with their fathers in the day that I took them by the hand to bring them out of the land of Egypt, which my covenant they brake " (Jeremiah 31:32). Israel broke the covenant of separation and distinctiveness. We have seen that in the Old Testament circumcision is a type, or symbol, for in the New Testament it is stated that circumcision is of the heart -- not in the flesh, but in the spirit -- and it just means this: a heart that is wholly devoted to the Lord. By that symbol the seed of Abraham became God's exclusive people for the time being, and everything that we have in the Old Testament about God's wish for this people shows us how jealous He was over those people. God called Himself their husband (Jeremiah 31:32), and there was never a more jealous husband than He! Let Israel have anything to do with any other husband and you will hear the thunder, and the weeping, of the Prophets! God was so jealous for Israel. Now see what Paul says about the covenant seed of Abraham. He heads this whole thing up into Christ: "Now to Abraham were the promises spoken, and to his seed. He saith not, And to seeds as of many; but as of one, And to thy seed, which is Christ" (Galatians 3:16). "He is not a Jew which is one outwardly, neither is that circumcision, which is outward in the flesh; but he is a Jew (or an Israelite), which is one inwardly; and circumcision is that of the heart, in the spirit." So Jesus Christ is the seed of Abraham, and Paul speaks of the circumcision of Christ. Let us go back into the Old Testament to that great Messianic chapter, Isaiah 53: "He shall see his seed ... He shall see of the travail of his soul." Well, we know more than the Prophet Isaiah knew about that! We have been with Him in Gethsemane in the time of the travail of His soul, and we are with Him on the other side of the travail. How many are the seed of Christ since then! Dear friends, if ever you are tempted to think that Christians are few, and that we are only a very small people in the millions of this world -- open the windows! Look into the book of the Revelation: "A great multitude, which no man could number ... ten thousand times ten thousand, and thousands of thousands." The number cannot be expressed in human language -- and they have been gathered since the travail of the Lord Jesus. He is indeed seeing His seed! Gethsemane has been the most fruitful garden in all history -- and you and I are of His seed! We are born out of His travail and are in the covenant made with the new Israel. But do remember that the meaning and the value of the covenant depend upon our devotion to the Lord! This is a thing which is so evident: the greatest fruitfulness has always come from the lives most devoted to the Lord, the people of the undivided heart. This covenant has two sides. As we have already said, the New Testament takes many warnings from the history of Israel, and we may fail of all that that covenant means if our hearts are divided and we try to live in two worlds. Let us look at a little incident in the life of Abraham. It is in chapter 15, when God came to make His covenant with Abraham and his seed, and [5/6] something happened which many people have not been able to understand. The Lord commanded Abraham to bring certain things for a sacrifice either to a large altars or to two altars, for the Lord told him to divide the sacrifices in two and to put one half on one side and the other half on the other side. Now notice that these are two sides of the covenant. On the one side is Abraham and his seed and on the other side is God. God is about to enter into a covenant with Abraham and his seed, but the covenant has two sides. Now notice what happens! The vultures came down to try and steal the sacrifices. How greatly significant this is! All the powers of darkness are against this covenant, and all those evil fowls of the air are out to rob God and His people of this covenant. It says that Abraham beat them off. His rod was busy that day, and the vultures said: 'It is no good. We had better give up and get away from here.' Then Abraham went to sleep and "an horror of great darkness fell upon him". My point, and, I believe, the point of the Scripture is this: there is always a terrible battle with hell to secure a life utterly committed to God. No one who is going to be utterly for Him is easily won. That is all in this little story in Genesis 15. It may be your story! This is something of what it means to have a heart that is circumcised, for a circumcised heart is a heart set free from all self-interest. Was that true of Abraham? After many years what had seemed impossible came to pass, and God gave him a son; and that son was God's miracle. You would expect Abraham to say: 'God gave me that son and I am going to hold on to him. I will never let him go, because God gave him to me.' There was a little boy once, and a baby came into the home. One day the mother said to the little boy: 'We are going to take Baby to the meeting and give him to the Lord.' The little boy's face fell, and he said: 'Mummy, you can lend him to the Lord, but we must have him back again!' You know, that is the kind of consecration that a lot of Christians make; they have some personal interest in their consecration. But about that God-given gift to Abraham God said: 'Take him and offer him!' Friends, learn this lesson! Do not think that because God has given you something by a miracle you can take it for yourself. I will not try to say what it might be. It might be your very ministry, for there is always a peril of taking our ministry and using it for ourselves. But Abraham was truly circumcised in heart, and the same was true of Hannah. How long she waited for that child, Samuel, and how much she suffered! How earnestly she prayed! And then, at last, God gave her the child. What did she say? 'Thank you, Lord. I will never let this child go now!'? No, she said: 'For this child I prayed and the Lord has given me my request. Therefore I have given him to the Lord for as long as he lives.' She, too, was circumcised in heart. From some of his Psalms we know that the one great ambition of David's life was to build the temple, and he worked and sacrificed for that temple. He said: "I will not come into the tabernacle of my house, nor go up into my bed; I will not give sleep to mine eyes, or slumber to mine eyelids; until I find out a place for the Lord, a tabernacle for the Mighty One of Jacob." (Psalm 132:3-5). He was collecting private money, as well as materials for the temple, for he said: "I have a treasure of mine own of gold and silver" (1 Chronicles 29:3). Then he received the pattern of the temple from the Lord, and said: 'The time has come, and my life's ambition is about to be realized. The one thing for which I have lived is now going to be mine -- but what is that? Someone is at the door. Come in! Oh, it is a Prophet. Yes, my friend, what have you come to say?' 'I have come to tell you from the Lord, David, that you shall not build [6/7] the house. Thy son shall build it.' What did David do? What would you do? Well, what did David do? He said: 'It does not matter about my disappointment! The thing is that the Lord must have what He wants. My interests are nothing beside His interests.' So he gave everything to Solomon. Perhaps he had seen something more: "And I will dwell in the house of the Lord for ever" (Psalm 23:6), and that is better than any earthly house! "THE WORD OF HIS POWER"
"They obeyed the voice of the Lord their God, and the words of Haggai the prophet, as the Lord their God had sent him; and the people did fear before the Lord" (Haggai 1:12). THE word of the Cross is the power of God, and in this verse we have read about a powerful word, the result of which was: "they obeyed" and "they feared". What was it they obeyed and feared? A powerful word from God. And what was that like? There were the words of the prophet, but there was something more -- there was the voice of the Lord. There is one verse in the tenth chapter of the Gospel by John which we all know by heart: "My sheep hear my voice, and I know them, and they, follow me" (verse 27). "I am the good shepherd ... My sheep hear my voice ... and they follow me." Here again is a powerful word, and when we hear it we follow the Lord, for it is His voice. There is a word in Isaiah 55 which we often use falsely. In past days, when I have given a very cheap and thin message, I have given myself this false comfort: 'However, the word of the Lord shall not return void! ', but Isaiah does not give us that comfort at all. The Lord says: "My word that goeth forth out of my mouth shall not return unto me void" (verse 11), and the question is not whether the word went out from my mouth (it always does!) but -- did it go out from the Lord's mouth? If it only comes out of my mouth you only hear my voice, and therefore the sheep do not follow the Lord. My mouth can give no powerful word at all. But if the word comes out of the Lord's mouth then the sheep hear His voice. Therefore always ask this question: 'Did my word go out from the mouth of the Lord? Am I the mouthpiece of the Lord?' Only He is capable of a powerful word, for He speaks in the spirit of the Cross. When in John 10:27 the Lord says: "My sheep hear my voice", you cannot take that word out of its context. Four times before that verse He has said -- in verses 11, 15, 17 and 18: "I give my life for the sheep ... I lay down my life for the sheep ... No one takes my life away from me ... I lay it down of myself." I give My life, and then I speak' -- and that is the voice of the Lord, that is the word of the Cross, and that is the word of His power. "I have power to lay down my life, and I have power to take it again." Therefore the Lord has a powerful word, and it is the word of the Cross. All this has to do with our conception of what ministry and service really are. What is service? It is not doing something for the Lord, but doing His will. Most Christians are ready to do something for the Lord, but I doubt whether we are all ready to do His will. The Lord Jesus has given us His own definition of ministry, of service, in John 12:26: "If any man serve me, let him follow me." That is all! Ministry, or service, is nothing other than obedience -- and obedience might well cost you everything, even your own life. I am sure that our dear brother Abraham was willing to do anything for the Lord except bring his son to Mount Moriah! Abraham might easily have argued with the Lord and said: 'I can serve You in many ways, Lord', and the Lord would have answered: 'There is only one way in which you can serve Me, and that is by doing what I tell you to do.' Ministry, service, obedience and life are one and the same thing. Here comes the word of His power. If Abraham had spoken a thousand words and preached wonderful sermons without going to Mount Moriah, then the people would have heard the words of Abraham but not the voice of the Lord. It would not have been the word of the Cross, and it would not have been a powerful word. Here is the centre of things. The word of Abraham has power even today, and we can sense the voice of the Lord in it. That is because Abraham's word went forth out of the mouth of the Lord, and it did not return void to the Lord. That is ministry, and that is why those who have ears that can hear can easily discern the voice of the Lord when they listen. Two men can speak and give almost the same message, and with one you sense the voice of the Lord, but with the other you hear only the words of the man. In my country people speak a lot about power in these days, and many use all the power of their voices and think: 'Now my message is powerful!' Abraham might have been able to cry out so loudly that they could have heard it back in Ur, but there would have been no power in that. When he went to Mount Moriah he did not even raise his voice, but the power of the living Lord, the power of the Cross, was there. Are you full of the spirit of the Cross? That means: Have you followed Him? Then He Himself is speaking through you, and you are His mouthpiece. I even know some dear Christian people who say: 'If I obeyed the Lord I would have to leave my ministry, and therefore I cannot obey!' They think they must be disobedient in order to serve the Lord! And I know many who have this idea: 'If I did what the Lord tells me, I would lose everything' -- but may I ask you this question: Has the Lord ever told you to keep anything? Only by our losing everything through obedience can the Lord speak through us. He Himself was obedient right unto death. What could He say on that Cross? He had lost everything. Therefore He could say everything in the power of the Cross, and that was ministry. Here was the true Servant of the Lord, here was the voice of the Shepherd giving Himself without reserve, and therefore being the mouthpiece of the living God. There is no bypass to power, but just the one narrow way leading right unto power -- the way of obedience, the way of following our Lord. He not only said: "If any man serve me, let him follow me", but He went on to say: "And where I am, there shall also my servant be" (John 12:26). We like to put that into the future, but where is the Lord today? Is He in a very popular place? Is He recognised by the so-called Christian people? Where is He? He is outside -- and "where I am, there shall also my servant be". Outside! But it is only as you are outside that you are able to speak the word that penetrates everything. The Lord's ways are not ours. His ways of ministry are not ours. His thoughts are not ours. His ideas about ministry, service, are not ours. The Cross is, and remains, the centre of everything, even the centre of power, the centre of ministry, and so He says: 'No man can serve Me as he is, and no man can speak for Me as he is in himself. No man can serve Me if he follows his own ways and ideas. Will any man serve Me? Then let him take up his cross daily and follow Me!' If you do that, the Lord will privilege you with the word of the Cross, and no other word is the word from the Lord. No other word comes out of the mouth of the Lord. TO the East of India and next door to China there lies the large country of Burma. Missionary work is no longer possible there, but there are many Christians, and it is now 150 years since the Gospel was first taken to that land. The man most responsible was Adoniram Judson. He suffered untold hardships, but he never gave up, because he himself had had such a wonderful experience of the love of Christ changing his whole life. Adoniram Judson was a student at Providence College, and he was the son of a Christian minister. I am sorry to say that as he began to grow up he turned away from his father's faith, and by the time he became a student he was sure that the clever thing to do was to say that there is no God and to realize that it is silly to talk about a future life after this one. So, like many students of today, he began to call himself an atheist, and he joined a set at his college who took delight in scoffing at any kind of faith. One of the leaders of this set was a gifted and popular young man whom we will call Edwards. Judson became a close companion of his, and was so charmed with his wit that he loved to have his approval. They took pleasure together in making fun of any kind of Christianity. Judson's father was greatly saddened by this, but his son would not listen to what he had to say, so that in the end all he could do was to pray that Adoniram might be saved from his bad companions and his mocking of God. Off he went to bed, but he found that the partition between the two rooms was very thin and in the stillness of the night he could hear the man who was so ill. In fact, he could not help hearing him, for as he lay awake he heard groans and cries of despair from his unfortunate neighbour. The man was clearly afraid to die, and although he cried to God, it was only in dark despair and not with any kind of hope. Judson was greatly moved, but he tried to laugh it off; ashamed of what his college companions would say if they knew of his weakness. Above all, he wondered what his gay friend Edwards would say if he knew that his young companion, who had often laughed at death with him, was now soft and weak about it. The groans grew worse, and Judson wildly wondered whether he ought to pray to God for help for this unhappy sufferer, but then he realized that he would never again be able to look Edwards in the face if he did so. It was a dreadful night, and he shuddered to hear the evident distress of the dying man. Judson was stunned to find that this was the very man whom he had not wished to offend; the one who had been so funny when he was pouring scorn on those who were worried about death and eternity. He remembered the cries and the groans, and realized how easy it is to mock and say foolish things when all seems well, but how hard it is to face up to the real fact of death and judgment. Instead of going on with his tour he turned the horse's head back towards his old home, and with a heavy heart he told his father of the shock he had had. He begged his godly father to help him to find a faith which could stand the test of death and eternity, and the father had the joy of telling his boy how God so loved the world that He gave His only Son so that those who believe on Him will not be lost but enjoy eternal life. Of course, Adoniram had heard this often before, but he had never been willing to open his mind and heart to the truth and to God's great love. He had thought that it was smart to scoff, but now he knew how foolish he had been. It took much persuading and praying before he could credit the fact that Christ still loved him, and that in spite of all he could still find life through believing. At last the assurance came and his heart became so filled with the love of the Lord Jesus that nothing would satisfy him but to take the [9/10] same message of life to those who had never heard it. Ten years after that night of awakening he was out in Burma, trying to help the Karen people to know the same Saviour. He suffered greatly for his faith. After a period of nearly two years in a dark and dirty prison he was sentenced to death. The exact date and time of his execution were proclaimed, and once more he had to face the grim reality of death. This time, however, it was quite different, for the love of Christ had taken away all fear. I am glad to say that he escaped, and was able to go on with his witness for Christ in Burma. Many were won for Christ among the Karens. "Think much on the love of Christ", Judson used to say to all the enquirers and converts. In fact, his favourite text was "the breadth, and length, and depth, and height of the love of Christ" (Ephesians 3:18). I wonder what your favourite text is! - H. F.
"... who delivered us out of the power of darkness, and translated us into the kingdom of the Son of His love" (Colossians 1:13). IF we want to know anything about kings and kingdoms, there is one book in the Old Testament which is full of those words, and that is the Book of Daniel. There are a number of chapters in that book which are narrative and tell us what happened, and it is about those chapters, particularly chapters two to six, we shall be speaking. They cover a lot of ground; and if you will read them over again you will find, I believe, that they are all connected. Chapter 2 brings before us in a graphic way that of which the verse in Colossians reminds us: there are only two kingdoms. You remember that Daniel and his friends prayed, and God gave revelation in answer to that prayer. That revelation was that there is an earthly kingdom -- the image of various metals -- and that there is a heavenly kingdom. I expect Nebuchadnezzar felt rather pleased to find himself in the centre of the vision -- "Thou art the head of gold" -- but has it ever occurred to you that Daniel and his three friends saw where they were in that vision? They were not in the image, for God has delivered us from that dominion -- and what a dominion it is! Do not become too interested in the different kingdoms on the earth and what they represent, for you may lose sight of the fact that there is only one kingdom. The nations may come and go, the metals may change, but there is only one kingdom. Daniel and his friends may have prayed that the Lord would remove Nebuchadnezzar, but if He had done so, the kingdom would go on -- and how we have found that, even in our day! One tyranny departs only to make way for another. There is really only one kingdom -- the Colossus of man's making fixed upon the earth, and one day to be destroyed. You notice that when the last expression of the kingdom is destroyed, then, and not till then, the whole image will fall, for it stands as one -- and God has delivered us from that! Then there is another kingdom. Nothing much is said about it; nothing of the appearance, the constitution, the shape, the form and the expression of it, as there is in the case of the earthly kingdom. It cannot be described, for it is heavenly. All that can be said is that it comes out of a mountain and -- the most important thing -- man never made it: "Made without hands." The God of heaven has a kingdom in preparation which is hidden from view now. So far as earthly grandeur, size, dimension and appearance are concerned it is nothing to be compared with the earthly kingdom, but one day it is to be revealed as God's answer -- the kingdom of His dear Son. And Daniel and his friends realized that they belonged to that kingdom, and Colossians 1:13 tells us that we are to realize that we do not belong to the one kingdom, but to that other. Of course, this does not mean that Daniel and his friends had nothing to do with anyone or anything in Babylon, for they did. They had names given them, and you will see that they were called by those Babylonish names, but when Daniel and his friends got together to pray, they did not call one another Shadrach, Meshach and Abednego; they used their real names. There was a fellowship of life that belonged to the other world, the world of their birth and of God's purpose. But they bore these Babylonish names apparently without protest and answered to them. They lived and worked in [10/11] Babylon and to the outward eye they appeared to have a part in the ordinary life. Take note of that, for the real difference is not outward, but inward. So, when we come into chapter 3, we find that though Shadrach, Meshach and Abednego worked and lived in Babylon, when it came to a spiritual issue they were men who had no heart relationship at all with that other kingdom. And what happened to them? That is the development of the story! What does happen if we repudiate and refuse this kingdom of darkness, not in some outward way but in an inward heart attitude? Well, you know that in chapter 3 we have the story of the fiery furnace, heated "seven times more than it was wont to be heated". "He hath delivered us from the kingdom of darkness" -- but as soon as we, in a really living way, take up our place in this world as those who are delivered from the kingdom of darkness, we shall find that kingdom of darkness challenging us. No one is permitted to live in Babylon and in heart be separate from Babylon without knowing the spiritual strength of evil which is behind Babylon. And let me say in passing, and by the way, that of the various nations and cities in the Bible that speak of the power of the god of this world, Babylon is one which speaks of the world from a religious point of view. However, that is the issue. "Delivered from the kingdom of darkness" sounds beautiful when we sing it in a hymn, and it is nice when we have a vision of what is the glorious end of that other kingdom, but we are in a fools' paradise if we think we are going on singing about it, studying it and talking about it until it comes. No! We are going to be faced immediately with the challenge as to our own heart separation from this thing, and the furnace will be heated seven times. Perhaps that explains some of our experiences for which there is no other explanation. Why is the furnace heated seven times? Because in a new way, by His grace, we have laid hold of the fact that He has delivered us from this dominion of darkness. It does not sound like deliverance, but it is Satan's reaction to our position of faith about our deliverance. Is there an alternative? Is there not another way? Yes, there is another way, and if we go on into Daniel 4 we will find that other way, for this chapter is about the man who was not delivered -- indeed, he was bound up with the earthly kingdom. It is a long chapter, and is the story of the man who did the opposite of what these three men did. They repudiated Babylon. He gloried in it. They were put into the fiery furnace. He was the emperor on the throne -- but was he? Not for long! God challenged him. The three men were challenged by the devil, but Nebuchadnezzar was challenged by God. The three men had the fiery furnace heated seven times. Nebuchadnezzar, you will notice if you read this chapter, had God's judgments on him seven times. There is the alternative. But now, while for the moment we feel that the position of the three men in the fiery furnace is a dreadful one and that it is a hard way to repudiate the spirit of this world, when we read Chapter 4 we find that there is a harder way, for, while we may come up against the devil if we are true to God, we come up against God if we have any real heart relationship and affiliation with the kingdom of this world. God seems to have loved Nebuchadnezzar. He took pains with him, and in His mercy the king was not destroyed but was brought to his senses; but it is a very bitter, painful, humiliating experience to be brought to our senses by God. There are only two kingdoms, but those two kingdoms are very real. We have the stark alternatives, the extremes, in chapters 3 and 4: the extreme of those who are true to God -- for them it is the fiery furnace -- and the extreme of the man whose heart has the spirit of Babylon, and he is brought low seven times by the mighty hand of God. Those are extremes, but they are put for us in that extreme form so that we may appreciate the principle, and the principle is this: to belong to the one kingdom is to meet the devil, but to belong to the other is to meet the Lord. Well, we will come back to the young men in the fiery furnace, and we find that they are all right, after all. Indeed, it was the most wonderful experience of their lives. They were not burned, but were brought through, for they had the blessed, living Son of God with them in their trial. So we see that the vision of the heavenly kingdom always brings its challenge, but if we will stand firm and say, as they did: 'He has delivered us from this dominion and what happens to us is His concern, not ours', the Lord will take that stand with us. Let us leave Daniel in the lions' den for a moment and go back to chapter v -- the story of Belshazzar and the writing on the wall. He did the opposite thing to Daniel, just as Nebuchadnezzar had done the opposite from the three young men. They repudiated the image; Nebuchadnezzar embraced it. Daniel loved the holy things of God; Belshazzar despised them. I would suppose that the Lord somehow or other -- in a manner of speaking -- gets used to men's sinfulness, for he did not judge Belshazzar because of the drunkenness, the foulness, the debauchery and the horrible atmosphere of his court. At that time all that did not bring out God's judgment, though it will do one day; but there was one thing that did bring out His judgments, and swiftly. There were holy vessels that belonged to the house of God in Babylon, and in the midst of all the riot and feasting Belshazzar, in his drunken insolence, called for those holy vessels, despising what was of God. We know what happened -- the hand that wrote upon the wall the sentence: "Weighed in the balances and found wanting -- thy kingdom taken from thee." Once again let me say that though it is hard to be Daniel holding to the heavenly vision and facing the lions' den, it is not easier to take the opposite course and despise the heavenly Jerusalem. We come back to Daniel in the lions' den and find that the lions did not eat him after all. The Lord was with him. 'He hath delivered us from the dominion of darkness', and that does not only mean when we are walking on the streets of Babylon. It means, thank God! that when we are in the fiery furnace we are still delivered, because it is not merely a deliverance from, but a deliverance unto -- "translated us into the kingdom of the Son of his love". Thus Daniel and his friends can not only take the kingdom into Babylon, but they can take the kingdom into the fiery furnace and quench it by the presence of the Lord. And they are delivered even in the lions' den, sharing in the heavenly kingdom even there. We have, then, five chapters of the Book of Daniel, and each chapter brings a picture with a spiritual principle in it. They are governed by chapter 2 -- a picture of the two kingdoms -- and then tell us of what happened in ordinary, practical life to men, who were just as we are, in relation to those two kingdoms. Two of the men failed to appreciate the true implication of these things. In [12/13] two cases, with the other four, the revelation that had come to them transformed their whole lives. They did not only think about it, or talk about it. When it came to practical matters, they lived it and, what is more, when the devil sought to quench them, they proved it. What greater proof of the kingdom of heaven in power is there than that experience of the men in the fiery furnace? That is not what we think of when we read Colossians 1:13! We think of the issue when we are brought out and put on the Throne. That is a nice kingdom! We never think that it will be a fiery furnace heated seven times. I have no doubt that Daniel felt alone, but he did not stand alone. God sent an angel, but the Lord will do better than an angel for you -- He will be with you Himself. So let us take courage! The issues of these two kingdoms are fierce, and constant, and will go on right through to the end, but if we will stand firm we shall see, not only our deliverance from the kingdom of this world, but its overthrow; we shall not only see the prospect of the coming of the kingdom, but we shall share in the glory of His appearing. "He hath delivered us" -- let us be sure of it! "He hath translated us" -- let us give God thanks for it! - H. F.
WE have, in these messages, been seeing that each part (book) of the New Testament has a particular aspect of Christ to present for the Church in this dispensation. The writer in his apprehension of Christ has this burden and urge, and when we have read all the writings we have a very comprehensive presentation of our Lord. There is, however, another feature which is so very rich and helpful. It is that these separate documents are what they are in value because of their immediate practical context. It is the situations to which they are addressed which bring out the many-sided fullness of the mission, meaning and message of Christ. History, both temporal and spiritual, makes the Christ so necessary, but also so appropriate. This is so very clear when we see the background and occasion of these writings. The Letters to the Corinthians -- or the Church in Corinth -- are particularly rich in the drawing out of Christ, as I trust we shall see. Oh, for a pen dipped in the fountain of Divine inspiration to show even something of what is embodied of Christ in these Letters! One's heart fails before such an undertaking. When "Corinth" or "Corinthians" are mentioned, the reaction is immediately that of a frown. The disorders, the wrongs, the sins, and all that is reprehensible at once take the foreground of the mind. Truly it is a terrible and distressing state of things, and it may be excusable if a major question is asked as to whether that is Christianity. There is no passing over of it lightly and this element, of contrast and contradiction is not to be excused. The strongest things are said about it by the writer of the Letters. Face it! Take it all for what it is! Hide nothing! Having done so ask your major question: Why did God ever allow all this, and why did He allow it to be put into a document which would go out to ever-widening circles through an ever-increasing length of time? Why did not God cover this shame, this reproach, this contradiction to His own nature and will? When you have done all that, and asked that ultimate question, you have really only given the answer. God has never done that, either in the history of His greatest servants, nor in that of His chosen people. Over this strange way of God, a way that we think we would never take, we have to ask a very significant question: Would there be gain or loss from the standpoint of all future time if all this delinquency and wrong had been covered over and not have been allowed to be known to posterity? There are different ways of putting that question, but, have we, and the Church through the centuries, gained from the Letters to the Corinthians, seeing what [13/14] it was that necessitated these Letters? There are two main things that have to come out of the answer to that basic question. Firstly, the values that have accrued, which have been drawn out by the situation being dealt with. Secondly, why was it that such a situation could exist among Christians? These two matters are going to take us a long way, and into deep and very profitable waters or mines. That there was a battle, and a very hot one for God's testimony in Corinth, does not need arguing. Putting aside, for the moment, the tragedy and shame of the situation there, what of the values drawn out by it? Whatsoever things God prepared for them that love him. for the Spirit searcheth all things, yea the deep things of God." "Know ye not that the saints shall judge the world?" "Know ye not that we shall judge angels?" What a startling way of awakening us to the calling in Christ! What shall we say of chapter 13? Is there anything in all literature to compare with that? Read it in the various versions, such as Moffat's, the Amplified, etc. This is indeed a superlative standard for attainment. No wonder Paul himself elsewhere -- and later -- wrote: "Brethren, I count not myself to have attained." But pass on to chapter 15, this utterly breath-taking presentation of what the Apostle called: "The gospel which we preached". When we read on to the description of the different categories of the resurrection bodies of the saints -- sun, moon, stars, glories; the change and transformation from corruption to incorruption, and all the other details -- we are left standing, gasping, with one immense question: 'How did Paul come to know all this?' The only possible answer only increases the wonder of the revelation itself. It must be all of a piece with his statement about the Lord's Table in chapter x verse 23: "For I received of the Lord that which I also delivered unto you ...". Being in the past tense -- "I delivered unto you" must link this on to the second Letter, chapter 12: "I knew a man in Christ fourteen years ago ... caught up into Paradise and heard unspeakable things ...". Chapter 15 of the first Letter must be just the fringe of the "unspeakable things'. Have I established my statement and argument that the sad and deplorable situation at Corinth was sovereignly in grace made the very occasion of drawing out some of the most sublime things in Divine revelation? Thank God for sovereign grace! Now we must get nearer to the particular purpose of these messages, namely, what Christ means in this situation. The Old Testament and the New; etc. In between these contrasts stands Jesus Christ with what He means to each. His back is toward the first set with the mighty "No!" of His Cross. His face is toward the second category with the mighty "Yes!" of His resurrection. In this way Christianity is shown to be severed and rent in two. There is here revealed a Christianity to which Christ (in His mission, meaning and message) says positively "NO!" Over that Christianity is written a large "CANNOT". This is taken up for emphasis and pronouncement early in the first Letter, and runs on through the many matters which are standing for judgment and [14/15] correction. Only space forbids us tabulating these points of Divine veto. Let the reader read the Letters and note the points at which Christ says in effect: "Not so!" In that way -- in the end -- the inclusive and comprehensive verdict is: 'You will never get through to God's end in that way!' To help in seeing this we can note where the Corinthians are placed in spiritual history and geography. Pick out the allusions to the Old Testament in these Letters. Two things rise up in bold relief. One, the old creation with its darkness, chaos, disorder, 'voidness', and features of judgment. Two, Israel in the wilderness. We will take this second for our present purpose. Quite clearly, Letter one and chapter x puts the Corinthians (and a certain kind of Christianity) in the position of Israel between Egypt and the Land of Promise, and it does so with a very strong warning. The same position is postulated in Letter two, chapter 3, at verse 7 to verse 16. What, then, were the features of that position in Israel's history? 1. They were out of Egypt, the realm of judgment by sovereign grace, and baptized "in the cloud and sea" positionally. 2. They were in the way of the "heavenly calling", and God's purpose. Literally this is the man of soul, and the man of spirit. His summing up of this difference is that the man of soul cannot and does not go through. He does not come to maturity, but, even after years, he is still a "babe" (3:1-2). It is "he that is spiritual" who can, and does, go through! Paul strongly emphasizes the veto that rests upon the one when he says that "the natural [soulical] man cannot". Christianity has been very slow to even recognize, to say nothing of accepting, this great divide. For want of this discrimination (resulting from a deep ploughing and cleaving work of the Cross) a Christianity exists which is not going through to what God intends, and multitudes of Christians are aware of it! The universities and colleges may make doctors of medicine, philosophy, art, etc., but be quite sure, a man of the Spirit with the knowledge of "the things which have not entered into the heart of man" can no man nor university make! This is the argument and verdict of the New Testament. The inclusive point, then, is that Christ is other. He is the other Man, the Man of the Spirit. His knowledge, wisdom, ability, are of another order. The real effect of the indwelling and mastery of the Holy Spirit is to show and make Christianity a reproduction, a representation of Christ; the mission, meaning, and message of Christ is to produce that essentially other kind that He is (see 2 Corinthians 3:16-18). But read the two Letters again! BIBLE interpreters have been convinced that the words ostensibly addressed to "the king of Babylon" in Isaiah 14 have a larger context and can only be exhausted if seen to refer to some erstwhile angelic being. This conviction is strongly supported by other statements and allusions in different parts of the Bible, such as Jude 6, 2 Peter 2:4, Luke 10:18, Philippians 2:6 (margin -- implication to another). If this is true, then the above makes clear the three steps leading to Satan's downfall. They also [15/16] indicate the downfall of much more which has had a good beginning. There is much solemn and valuable teaching here, although the subject is not pleasant. "COULD THIS BE OUR MOST CRITICAL NEED?" "This tendency to oversimplification is itself a weakness and should be guarded against always.... For this reason I am hesitant to point to any one defect in present-day Christianity and make all our troubles stem from it alone. That so-called Bible religion in our times is suffering rapid decline is so evident as to need no proof; but just what has brought about this decline is not so easy to discover. I can only say that I have observed one significant lack among evangelical Christians which might turn out to be the real cause of most of our spiritual troubles; and, of course, if that were true, then the supplying of that lack would be our most critical need. "The great deficiency to which I refer is the lack of spiritual discernment, especially among our leaders. How there can be so much Bible knowledge and so little insight, so little moral penetration, is one of the enigmas of the religious world today. I think it is altogether accurate to say that there has never been a time in the history of the Church when so many persons were engaged in Bible Study as are so engaged today. If the knowledge of Bible doctrine were any guarantee of godliness, this would without doubt be known in history as the age of sanctity. Instead, it may well be known as the age of the Church's Babylonish captivity, or the age of worldliness when the professed Bride of Christ allowed herself to be successfully courted by the fallen sons of men in unbelievable numbers. The body of evangelical believers, under evil influences, has during the last twenty-five years gone over to the world in complete and abject surrender, avoiding only a few of the grosser sins such as drunkenness and sexual promiscuity. "That this disgraceful betrayal has taken place in broad daylight with full consent of our Bible teachers and evangelists is one of the most terrible affairs in the spiritual history of the world. Yet I for one cannot believe that the great surrender was negotiated by men of evil heart who set out to deliberately destroy the faith of our Fathers. Many good and clean-living persons have collaborated with the quislings who betrayed us. Why? The answer can only be, from lack of spiritual vision. Something like a mist has settled over the Church as 'the face of the covering cast over all people, and the veil that is spread over all nations' (Isaiah 25:7). Such a veil once descended upon Israel.... That was Israel's tragic hour. God raised up the Church and temporarily disfranchised His ancient people. He could not trust His work to blind men. Surely we need a baptism of clear seeing if we are to escape the fate of Israel ... surely one of the greatest needs is for the appearance of Christian leaders with prophetic vision. We desperately needs seers who can see through the mist. Unless they come soon it will be too late for this generation. And if they do come we will no doubt crucify a few of them in the name of our worldly orthodoxy. But the Cross is always the harbinger of the resurrection. Mere evangelism is not our present need. Evangelism does no more than extend religion, of whatever kind it may be. It gains acceptance for religion among larger numbers of people without giving much thought to the quality of that religion. The tragedy is that present-day evangelism accepts the degenerate form of Christianity now current as the very religion of the apostles and busies itself with making converts to it with no questions asked. And all the time we are moving farther and farther from the New Testament pattern. We must have a new reformation. There must come a violent break with that irresponsible, amusement-mad paganized pseudo-religion which passes today for the faith of Christ and which is being spread all over the world by unspiritual men employing unscriptural methods to achieve their ends." -- Dr. A. W. Tozer. There are various things in the New Testament [16/17] which were intended for a witness to Christ; for building up of the Body of Christ; for the glory of Christ, which -- for those very reasons -- have been taken hold of by Satan and simulated, imitated, and given a resemblance to the true, but have been made -- in the end -- to discredit Christ, and do just the opposite to their Divine intention. It looks so much like the true that many dear people of God are deceived, perplexed, and led into error. Mixture of error with truth has always been a very successful method of seduction, even from the beginning. God is imitated in idolatry, false worship. Christ is imitated in anti-Christ. The Holy Spirit is imitated in guidance and gifts. Man is deceived by the psychic simulating the spiritual. People, under the stress of pressures of run-down nervous batteries, neuroses, overstrain, spiritual accusations and condemnations, rush to the psychiatrist. The method is to get them to relieve themselves of their tensions by self-expression, divulging hidden things, and in extreme cases by hypnotism. This has a psychological effect and the patient feels 'wonderfully relieved'. Expression; expression! Self-expression! One man told the writer that he came away from the psychiatrist feeling that he had been "born again", something even better than his conversion! But -- yes, but! -- it all came back again, and worse than the former. Psychology -- the science of the psyche -- can be Satan's masterpiece in simulating the spiritual, and then plunging the soul into deeper depths of despair. While there is a releasing of the spirit in prayer and song, and sometimes release can only be experienced in such ways, and fellowship is a great means of such blessing, there is the counterfeit of noisy and soulical chorus-singing and unbalanced repetition. Music is often the greatest blessing and the greatest peril. "In the Spirit" is the Divine dictum. "I will ascend above the heights of the clouds"
This whole paragraph -- Isaiah 14:9-15 -- is an exaggeration, if by exaggeration is meant 'to heap up, to load beyond normal, to carry to excess', etc. "I will ascend above ..." holds this meaning -- 'I will exceed'. It is ambition run amok. It is pride in full tide. It is something unrestrained by modesty, humility and dependence. It is extravagance. It is just adding to what is right and true. It is overstepping the mark. It is inflation. This is the peril of the passionate soul. If Satan cannot keep back he will push over . If he finds earnest devotion he will urge it to excess. If he finds an active mind he will cause it to add that extra to the truth, so that the truth becomes untrue. In "the king of Babylon" we have the exaggeration of personality. "See this great Babylon which I have made." The "I", the ego, is assertive, pronounced, overmastering. Leadership and natural ability and gift become autocracy, dictatorship, even tyrannical. There is often a thin line between autocracy and spiritual leadership, and it is here that discernment is needed. The former forces, compels and makes legal. The latter comes of suffering, deep history with God, and sets a high standard, and keeps to it. This may be difficult for the flesh in others to accept, and they may wrongly interpret it. Leadership is a Divine gift and of great importance. No one will get far without it. Hence Satan has always marked down this function and its possessors for special attention to exaggerate it and defeat its true object. Dependence is the refuge of the spiritual leader, and the Lord very fully sees to this! There are many exaggerated movements in our time. Teaching is pushed just that much beyond its true meaning. Something right and good, and then the bit in excess. It is thought to be very spiritual, advanced teaching, but the line of actual meaning has been crossed, and confusion follows because of an unbalanced emphasis. This has so often been the cause of exotic and eccentric sects and groups, and their number is legion. The Athenian propensity was "some new thing", which usually means some new sensation. How powerfully Satan supports such exaggerations and makes error grow without proportion! He knows full well that he is going in this way to fill the world with disillusioned people who presently will not believe anything, particularly the truth. It was this very thing which made the Apostle John so strongly, almost vehemently, pinpoint the truth in his constantly repeated: "This is ...". See his letters, and note his emphasis upon "the anointing teaching all things". The context is anti-Christ in deception. "I will exalt my throne above ..."
"Exalt." "Above." The object, the goal, the climax of Satan's aspiration. It sounds fantastic and remote. But it is not so remote and unthinkable as it seems at first sight. Is not this the motif and stimulus of all power politics? If only we realized it, the undercutting of this was the reason for the Incarnation, because all sin has sprung from this [17/18] root. The birth, the childhood, the manhood, that teaching, and the Cross of Jesus Christ were a positive offset to worldly power and glory. Never did He seek to 'make an impression', draw to Himself or to His cause by prestige, elaborateness, glamour, or a show of natural glory. Even of His rightful heavenly glory and status "He emptied Himself". His Kingdom and His Kingship were not of this world. All this was to undo something which had been distorted. This something is in us all. We worship the idol of success. We have a totally false conception of strength, power, and importance. Jesus came to correct this in His own person. "Thou madest him to [in order to] have dominion." Yes, but not self-centred. "Bringing many sons to glory." Yes, but the glory of His infinite grace, favour without any merit! "We shall reign with him." Yes, but as worshippers of the Lamb! The test of everything is whether it really exalts Christ. Not in word only. That may be a form of simulation and exaggeration. The demon-possessed temple girl of Ephesus may sponsor and preach the Gospel, but it is a "deep thing of Satan", and the Apostle was not selling the Gospel cheaply to the devil to gain popularity. The holiness of Christ is the criterion! So we -- all so briefly -- note the way of Satan's course, but the way of his fall. The judgment upon his simulation, exaggeration, and predomination is "Thou shalt be brought down to hell". Over against the false may the Lord produce the true similitude of Christ: the true magnifying of Christ: the true exaltation and supremacy of Christ! The following message by the late Dr. A. W. Tozer, to be included in a further volume of addresses by him now in preparation, is, we feel, so much in keeping with the ministry of A Witness and A Testimony, that we borrow it for our readers, assured that they will be very glad to read it. It was recently in The Alliance Witness of the Christian and Missionary Alliance. And while mentioning this, may I say that, in early years of ministry and the Lord's work, I owed very much to the life of Dr. A. B. Simpson, founder of that 'Alliance'. - Editor. "About the midst of the feast Jesus went up into the temple, and taught. And the Jews marvelled, saying, How knoweth this man letters, having never learned? Jesus answered them, and said, My doctrine is not mine, but his that sent me. If any man will do his will, he shall know of the doctrine, whether it be of God, or whether I speak of myself" (John 7:14-17). THE key, the crux of this whole issue, is in verse 17. If any man is willing to do God's will, he shall know. Now, this question tells us a good deal about these people. It tells us that they held truth to be intellectual merely, capable of being reduced to a code. To know truth it was necessary only to learn the code. Most of them had no books of their own -- they learned by memorizing. That was their conception of truth. I gather this not only from verse 17 but from the whole Gospel of John. To these people truth was an intellectual thing -- just as we know that two times two is four. That is truth, but it is an intellectual truth only. They reduced divine truth to that status. They knew the laws: "Thou shalt have no other gods before me.... Remember the sabbath day, to keep it holy.... Thou shalt not ...". But to them there was no mysterious depth in truth, nothing beneath and nothing beyond the obvious fact. It was exactly here that they parted company with our Saviour, for our Lord Jesus constantly taught the beyond and the beneath. These people believed that the words of truth were the truth. And here is a basic misunderstanding of Christian theology with a moral and spiritual consequence that is vastly important. They believed that if you had the words of truth, if you could repeat the code of truth, you had the truth. That if you lived by the word of truth you lived in the truth. Here, it seems to me, is the weakness in modern Christianity. The battle line, the warfare today, is not necessarily between the fundamentalist and the liberal. There is a difference between them, of course. The fundamentalist says God made the heaven and the earth. The liberal says: 'Well, that's a poetic way of stating it; actually it came up by evolution.' The fundamentalist says Jesus Christ was the very Son of God. The liberal says: 'Well, He certainly was a wonderful man and He is the Master, but I don't quite know about His deity.' So there is a division, but I don't think the warfare is on these matters any more. The battle has shifted to another more important field. The warfare, the dividing line today, is between evangelical rationalists and evangelical mystics. I will explain what I mean. You can easily spot this man -- train your glasses on him and there he stands. You can tell he is on the other side, for he wears the uniform of the other side. But your evangelical rationalist wears our uniform. He comes in wearing our uniform and says what the Pharisees, the worst enemies Jesus had while He was on earth, said: 'Well, truth is truth, and if you believe the truth you've got it. Such see no beyond and no mystic depth, no mysterious heights, nothing supernatural or divine. They see only: "I believe in God the Father Almighty, Maker of heaven and earth: and in Jesus Christ His only Son, our Lord." They have the text and the code and the creed, and to them that is the truth. So they pass it on to others. The result is we are dying spiritually. Now, what about the evangelical mystic? I don't really like the word 'mystic' because you think of a fellow with long hair and a little goatee who acts dreamy and strange. Maybe it is not a good word at all, but I am talking about the spiritual side of things -- that the truth is more than the text. There is something that you've got to get through to. The truth is more than the code. There is a heart beating in the middle of the code and you've got to get there. Now the question is simply this: Is the body of Christian truth enough? Or does truth have a soul as well as a body? The evangelical rationalist says that all of that talk about the soul of truth is poetic nonsense. The body of truth is all you need; if you believe the body of truth you are on your way to heaven and you can't backslide and everything will be allright and you will get a crown in the last day. Now otherwise stated: Is revelation enough or must there be illumination? Is this Bible an inspired book? Is it a revealed book? Of course you and I believe that it is a revelation, that God spoke all these words and holy men spoke as they were moved by the Holy Ghost. I believe that this Bible is a living book, that God has given it to us and that we dare not add to it or take away from it. It is revelation. But revelation is not enough. There must be illumination before revelation can get to your soul. It isn't enough that I hold an inspired book in my hands. I must have an inspired heart. There is the difference. You can memorize all the texts of the Bible -- and I believe in memorizing -- but when you are through you've got nothing but the body. There is the soul of truth as well as the body. There is a divine inward illumination the Holy Ghost must give us or we don't know what truth means. Conversion is a miraculous act of God by the Holy Ghost; it must be wrought in the spirit. The body of truth is not enough; there must be an inward illumination. Christ's conflict was with the theological rationalist. It revealed itself in the Sermon on the Mount and the whole Book of John. Just as Colossians argues against Manichaeism and Galatians argues against Jewish legalism, so the Book of John is a long, inspired, passionately outpoured book trying to save us from evangelical rationalism, the doctrine [19/20] that says the text is enough. Textualism is as deadly as liberalism. Now revelation, I repeat, can't save. Revelation is the ground upon which we stand. Revelation tells us what to believe. It is the Book of God and I stand for it with all my heart; but there must be, before I can be saved, illumination, penitence, renewal, inward deliverance. I have no doubt that many people are eased into the kingdom. They are jockeyed into believing in the text, and they do; but they have never been illuminated by the Holy Ghost. They have never been renewed in their hearts. They never get into the kingdom at all. Now, there is a secret in divine truth altogether hidden from the unprepared soul. This is where we stand in the terrible day in which we live. Christianity is not something you just reach up and grab. There must be a preparation of the mind, a preparation of the life and a preparation of the inner man before we can savingly believe in Jesus Christ. Somebody asks: Is it possible to hear the truth and not understand the truth? Listen to Isaiah: "Hear ye indeed, but understand not, and see ye indeed, but perceive not" (6:9). It is possible to see yet not perceive. Paul says (1 Corinthians 2:4-5): "My speech and my preaching was not with enticing words of man's wisdom, but in demonstration of the Spirit and of power: that your faith should not stand in the wisdom of men, but in the power of God." Now the theological rationalists say that your faith should stand not in the wisdom of man but in the Word of God. Paul didn't say that at all. He said your faith should stand in the power of God. That's quite a different thing. Verses 9 through 14 say: "Eye hath not seen, nor ear heard, neither have entered into the heart of man, the things which God hath prepared for them that love him. But God hath revealed them unto us by his Spirit: for the Spirit searcheth all things, yea, the deep things of God. For what man knoweth the things of man, save the spirit of man which is in him? even so the things of God knoweth no man, but the Spirit of God.... But the natural man receiveth not the things of the Spirit of God: for they are foolishness unto him: neither can he know them, because they are spiritually discerned." Paul, the man of God, is saying: I came preaching and I preached with power that would illuminate and get to the conscience and to the spirit and change the inner man in order that your faith might stand in the power of God. My brethren, your faith can stand in the text and you can be as dead as the proverbial doornail, but when the power of God moves in on the text and sets the sacrifice on fire, then you have Christianity. We call that revival, but it's not revival at all. It is simply New Testament Christianity. It's what it ought to have been in the first place, but was not. Now look at Matthew 11: "Jesus answered and said, I thank thee O Father, Lord of heaven and earth, because thou hast hid these things from the wise and prudent, and hast revealed them unto babes. Even so, Father: for so it seemed good in thy sight. All things are delivered unto me of my Father: and no man knoweth the Son, but the Father, neither knoweth any man the Father, save the Son, and he to whomsoever the Son will reveal him." So there we have the doctrine taught plainly that there is not only a body of truth which we must hold at our peril; there is also a soul in that body which we must get through to, and if we don't get through to the soul of truth we have only a dead body on our hands. A church can go on holding the creed. and the truth for years and generations and grow old and die, and new people come up and receive that same code and they grow old and die. Then some revivalist comes in and gets everybody stirred and prayer moves God down on the scene and revival comes to that church. People who thought they were saved get saved. People who have only believed in a code now believe in Christ. What happened? That man had been trusting the dead body of truth until some inspired preacher let him know that truth has a soul. Or maybe God taught him in secret that truth had a soul as well as a body and he dared to get through and pursue by penitence and obedience until God honoured his faith and flashed the light on. And like lightning out of heaven it touched his spirit and all the texts he had memorized became alive. Thank God, he did memorize the texts and all the truth he knew suddenly now bloomed in the light. That is why I believe we ought to memorize. [20/21] That is why we ought to get to know the Word, why we ought to fill our minds with the songs and the great hymns of the church. They won't mean anything to us until the Holy Ghost comes. But when He comes He will have fuel to use. Fire without fuel won't burn but fuel without fire is dead. And the Holy Ghost will not come on a church where there is no Biblical fuel. There must be Bible teaching. We must have the body of truth. Jesus said if any man is willing to do God's will, he shall know -- he shall know the doctrine, he shall know the teaching. Now, this body of truth can be grasped by the average, normal intellect. You can grasp truth, but only the enlightened soul will ever know the truth and only the prepared heart will ever be enlightened. We make Jesus Christ a convenience. We make Him a lifeboat to get us to shore, a guide to find us when we are lost. We reduce Him simply to Big Friend to help us when we are in trouble. That is not Christianity. Jesus Christ is Lord. But when a man is willing to do His will, he is repenting and the truth flashes in. No man can know the Son except the Father tell him. No man can know the Father except the Son reveal Him. I can know about God, that's the body of truth. But I can't know God, the soul of truth, unless I am ready to be obedient. Before the Word of God can mean anything inside of me there must be obedience to the Word. Truth will not give itself to a rebel. Truth will not impart life to a man who will not obey the light! "If we walk in the light, as he is in the light, we have fellowship one with another, and the blood of Jesus Christ his Son cleanseth us from all sin." If you are disobeying Jesus Christ you can't expect to be enlightened. If a sinner goes to the altar and a worker with a marked New Testament argues him into the kingdom, the devil will meet him two blocks down the street and argue him out of it again. But if he has an inward illumination and he has that witness within because the Spirit answers to the blood, you can't argue with that man. He will say: 'But I know.' A man like that is not bigoted or arrogant, he is just sure. Now that's revival, but yet it is not revival either; it is normal Christianity. It's the way we should be. "If any man will do his will, he shall know." But you say you're going to take a Bible course. If you are holding out on God, refusing to follow Jesus, you can take a course and learn all about synthesis and analysis and all the rest. But you might just as well read Pogo; all the courses in the world won't illuminate you inside. You can fill your head full of knowledge, but the day that you decide you are going to obey God it will get down into your heart. You shall know. Only the servants of truth can ever know truth. Only those who obey can ever have the inward change. You can stand on the outside and can know all about it. I once read a book about the inner spiritual life by a man who was not a Christian at all. He had an amazing penetration. He was a sharp intellectual, a keen Englishman. He stood outside and examined spiritual people from the outside but nothing ever reached him. You can read your Bible -- read any version you want -- and if you are honest you will admit that it is either obedience or inward blindness. You can repeat the Book of Romans word for word and still be blind inwardly. You can quote the whole Book of Psalms and still be blind inwardly. You can know the doctrine of justification by faith and take your stand with Luther and the Reformation, and be blind inwardly. For it is not the body of truth that enlightens; it is the Spirit of truth that enlightens. If you are willing to obey the Lord Jesus He will illuminate your spirit, inwardly enlighten you, and the truth you have known will now be known spiritually and power will begin to flow up and out and you will find yourself changed, marvellously changed. In that great day of Christ's coming all that will matter is whether or not I have been inwardly illuminated. Inwardly regenerated. Inwardly purified. Aberdare £3; Amstelveen, Holland £17 5s. ; Ashtead £2 10s. ; Auckland, New Zealand £1; Bangalore, India £10; Beckenham 10s., £5; Bedford £1; Belfast £5, £1, £2 7s. ; Bengeo £1 3s. 6d. ; Bideford £1 10s. 10d. ; Blackpool 15s. ; Blackwood £1; Bolton £4 15s. ; Boorhaman, Australia £6 19s. 6d. ; Bournemouth 16s. ; Brentwood 10s. ; Bridlington £2; Brighton 10s. ; Bristol £2 2s. ; Bromley £6, £3, £6; Buntingford £1; Clacton-on-Sea £1 3s. ; Cleveland, Ohio 16s. 8d. ; Colchester £1 0s. 6d. ; Colwyn Bay £1; Congleton £3, £2; Coulsdon £1; Croydon 12s. 6d. ; Deal £1 18s. ; Doncaster £3 10s. ; Dublin £1, £2 17s. 6d. ; Durham 12s. 6d; Eastbourne £4 14s., £4 17s. 3d. ; Edinburgh £1 10s., £5 5s. ; Farsund, Norway £5; Felixstowe 10s. ; Feltham 6s. ; Glasgow £2, £1; Halesowen 10s. ; Hastings £5, £5; Hemyock £4 3s. 6d. ; Henley-in-Arden £2; Hirwaun £1; Horley £1 16s. ; Hornchurch 3s. 6d. ; Humbie £2; Ipswich £2 5s. 6d. ; Kaleden, Canada £3 10s; Knock £3; Leamington Spa £5; Leeds £1; London N.14 £10; N.19 £1 6s. 6d; S.E.3 15s. ; S.E.12 £5, £3; S.E.23 £5, 5s., £1, £5; S.E.25 £1; Loughton 17s. ; Louth £4 7s. 4d. ; Lydd £2; Maidstone £2; Manchester 10s. 6d. ; New Milton £20; Niagara Falls, Canada £3 16s. 11d. ; Norwich £3; Ormskirk 14s. ; Paris, France £2 17s. 6d. ; Pontypool 10s. ; Porth 16s. ; Preston £3; Redhill £4 16s. 9d. ; St. Keverne £10; Saskatoon, Canada £3 1s. 6d. ; Sevenoaks £4 4s. 9d. ; Sheffield £1 10s. ; Simmozheim, Germany £1; Somers Point, New Jersey £4 3s. 4d. ; Stonebroom £1 2s. 6d. ; Stowmarket 10s. ; Sutton £5; Trelewis £5; Tunbridge Wells £1, 13s. 6d. ; Wales £1; Wimborne £1. Total: £289 13s. 4d. Allentown, Pa. $5; Baltimore, Md. $5; Bedford, Ind. $20; Birmingham, Ala. $25, $25; Braintree, Mass. $10; Brooklyn, N.Y. $15; Cleveland, Ohio $2; Clubb, Mo. $5.35; Corinna, Maine $5; East Corinth, Maine $49.25; Fort Worth, Texas $10, $10; Franklin Square, N.Y. $11; Hacienda Heights, Calif. $9.30; Hastings, Minn. $2; Highlands, Texas $2; Hilversum, Holland $5; Irving, Texas $2.50; Lansdowne, Pa. $20; Lexington, Ky. $25; Los Alanitos, Calif. $10; Mansfield, Ohio $10; Marshall Minn. $30; Monroe, Mich. $9.50; Mt. Vernon, N.Y. $5; Orlando, Fla. $5; Pinson, Ala. $10; Richmond, Va. $5; Ridgefield, N.J. $20; San Dimas, Calif. $10; Westchester, N.Y. $10; Williamsport, Pa. $5. Total: $392.90. Val Marie, Saskatchewan $2; Woodstock, Ontario $10. Total: C$12.00. Bern, Switzerland Swiss Fcs. 20.00. "Out of much affliction and anguish of heart I wrote unto you ... that ye might know the love which I have more abundantly unto you" (2 Corinthians 2.4). A ministry that is to bring healing and life must spring essentially from experience. This fact is strikingly displayed in the apostle Paul. The ministry of 1 Corinthians, for example, is based firmly on the man revealed to us in 2 Corinthians. The books and booklets listed below can all be ordered by post from the addresses given at the end of the list. More detailed information about the literature is available on application to the Witness and Testimony office in London. The six issues of the magazine, bound together, to form a volume with light blue art paper cover, are available for the following years: 1956, 1959, 1964, 1965, 1966, 1967, 1968, 1969. Price per volume (1 year): 5/- ($0.70). Certain back issues of the paper are also available and will be sent to those who desire them at cost of postage only. Please indicate the date of the issue(s) required. Orders totalling less than £1 -- please add 2d in the shilling. Orders totalling more than £1 -- please add 2/6 in the £. To the U.S.A.: Please add 10 cents in the dollar. 39 Honor Oak Road, London, S.E.23, England. Indiana 46268, U.S.A. California 90006, U.S.A.
Virginia 23502, U.S.A. Madras, 7, India. Seigneur Jésus-Christ Qu'en sera-t-il de cet Homme? The above literature in French can be obtained from: Mr. J. C. Lienhard, 12 rue des Peupliers, 92 Bois-Colombes, France. Telephone: 242 93-32.